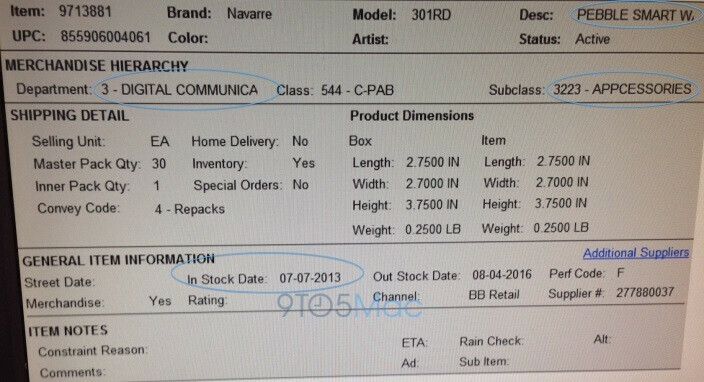 If this leaked image of a Best Buy inventory system is correct, we may see the super-crowd-funded Pebble smart watch on sale this coming weekend (in the US anyway). Some of the early backers of the project have already received their Pebble, we say some because many of those that ordered grey, orange and white Pebbles are still waiting for their devices. In fact, there are some who ordered the base black color that are still waiting too. 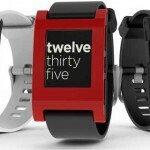 The sheer demand forced Pebble to push back its original ship-date estimates from September to later in 2012. By December 2012, delays were still plaguing Pebble and now over a year after funding closed for the project, it would seem that they just cannot keep up. Since the original time line has been delayed so much, those that are still waiting may not be thrilled by the news that Best Buy may be stocking up this weekend. The picture clearly notes the Pebble and an “in-stock” date of Sunday July 7th. For this particular Best Buy location, it appears it will be getting only 30 Pebbles to start with. There is no color listed, so it might be safe to assume black. Are you a Pebble backer? Do you have your Pebble? If not, how does this news strike you? That Pref Code isn't something they normally use. Someone know what that means?